What is a good moveset for Aegislash? If you have a good competitive moveset for Aegislash, post an answer below and upvote the best ones. Movesets for any of its pre-evolutions can also be shared on this thread. Aegislash Pokédex and learnset for reference. Plenty of Kalos will be OU. Aegislash is a bit of a hit or miss with Stance Change so I prefer an eviolite Doublade with Hairy Shed's staple moveset and protect instead of King's Shield. With 150 in both defences in shield forme, this guy makes an amazing staller. I invested in Sp.Def because King's Shield and Iron Defence walls physical attackers. King's Shield is to prevent damage and harm physical attackers, as said above, while Toxic slowly drains your opponents health. Iron Defence + King's Shield combo makes physical attackers virtually useless on him. Shadow Ball/Flash Cannon to KO an opponent that may be a threat, usually ghosts so I advise Shadow Ball. If you see a fire, ground or dark type, flee. 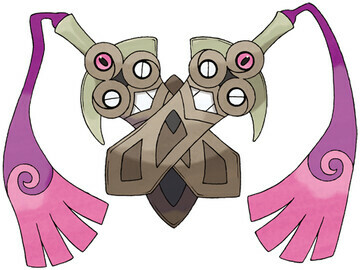 I have an Aegislash moveset that is sure to get it banned! So this one is a pretty dickish. First off, in order to use this correctly, you need to know what to do and when you do it, and be able to strategist with this moveset in battle. The goal is to incapacitate your enemies by using toxic and possibly attract (which if you can use attract, then use it first, and not to mention attract can seriously complicate things for your opponent), and then spamming king's shield, and tanking attacks in shield form and healing back up with leftovers and spamming King's Shield when needed. It is actually GOOD if Aegislash has really low speed!!! If Aegislash goes last in a turn, then he can stance change, get out a sacred sword, and then use King's Shield next turn to stance change before the opponent can attack, effectively getting rid of any opportunity to hit Aegislash while in blade form. Also, Aegislash's shield form is so bulky that it shouldn't be a problem tanking attacks due to being slower than the opponent. I recommend trying this one out, because it can seriously SERIOUSLY do some damage to your opponents team! And even against Pokemon that have supereffective moves against it, it is still somewhat capable of doing a number on the opponent (although in this case I'd recommend having the evs into all defense and sp. defense). This set has won me so many battles in OU. Rock slide against fire types, Swords Dance is obvious, Shadow Sneak for priority, and Sacred Sword if they are a normal type. This Guy has massive potential under the right circumstances.Swords Dance (+3 atk on base 110 stat) then power trick (still leaves you with base 110 def, which is till great). Now you can have Priority with Shadow sneak + a sharply (+3) base 150 attack, or get massive damage with Gyro ball since Doublade is very slow or iron head for STAB. I've never tried this, but I think this is good for Smogon Triples. Really easy, works ridiculously well in a trick room based team thanks to its ridiculous defensive stats and overwhelming offensive ability. Even without EV investment, it doesn't struggle much against anything, Weakness Policy is there for coverage, in defensive form this isn't gonna get 1 hit by anything. Team this with a Gothitelle/Rhyperior or a Mega Mawile in Trick Room set and it's deadly. A great Toxic stall set! Drag out the poison, and finish them of with priority Shadow Sneak. I once took out 3 Pokemon, and left the other 3 below half health and poisoned with this amazing set. This thing is such a fun sweeper. The main goal is to set up a few Swords Dances and then Shadow Sneak all over the place (duh to the lack of speed investment). Its defense is through the roof and this thing can take Shadow Claws, Crunches, Earthquakes, and Flare Blitzes no problem, while the Eviolite means you can usually take at least one special attack and then bop whatever Dark or Normal type that hit you with a Sacred Sword. Iron Head doesn't serve much of a role but its helpful for any Fairies you may encounter and its a stronger stab than Shadow Sneak. I did not use Swords Dance, as that may leave you open to attacks in competitive battling, where there are no healing items. I used Toxic and not Will-O-Wisp, because it gets worse every turn. Double Team makes attacks rare to hit him and with his low speed stat, he would turn into sword form last, so moves would never cause too much damage, even if they did hit. Sacred Sword, I mean, he's a LITERAL SWORD!!! He needs this move!!! Swords Dance, again, he's a sword. Not just that, he's a sword who can dance. It's in THE NAME, PEOPLE!!! King's Shield, because he's a shield, too and it's his signature move. Shadow Sneak, for STABing purposes and to sneak in the shadows of your victory. Say what you want, but I think a Special Attack Aegislash is better than a Physical set. You don't need much def EVs, since you can scare off Physical sets with King's Shield. You want a nature that does not boost anything, and if the user tries to use a super effective move... BAM! Weakness Policy activated then you attack next and wreck everything. This set works quite well. for me, this set seems to work. double team/ destiny bond: either set up with double team, or just knock out opponent. King shield really only works if you go last. You're slow enough to take a hit in shield form, then either attack with Gyro ball or shadow ball, or just set up with double team. when your in blade form, king shield to shield form. Destiny bond only works a turn before you're K.O, so it can be annoying if you tank a hit next turn. Held item for my Aegislash? Sacred Sword or Iron Head for Aegislash? Can Aegislash learn Extreme Speed through breeding, and is it better than Shadow Sneak? Aegislash - How to train it? Iron Head or Gyro Ball on Aegislash? How do I get an Aegislash with Wide Guard in Pokemon X and Y? Is Quiet nature a good nature for Aegislash?